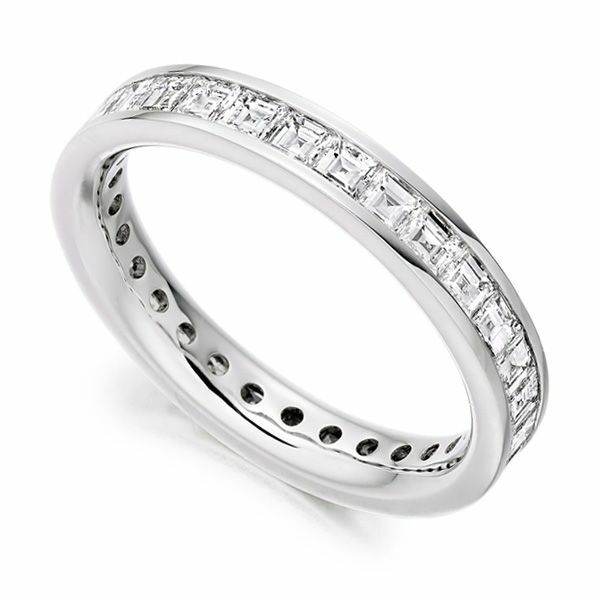 2 carats of diamonds, within a full diamond eternity ring, 3.5mm wide, with a full channel setting. Our channel set carrè cut Diamond Eternity Ring is set fully around a 3.5mm wide band. The setting allows for comfortable wear and combination with existing jewellery. With 2.05 carats graded F/G Colour VS Clarity, this ring dazzles with brilliance. Crafted in a wide choice of precious metals including 18ct Yellow Gold, 18ct White Gold, 18ct Rose Gold, 950 Platinum and 950 Palladium. For your added reassurance, Serendipity Diamonds, offers 60 day returns, a lifetime warranty and a detailed insurance valuation. Beautifully packaged, your ring will arrive fully insured by courier. Please allow 3-4 weeks to create your perfect ring.